The handle as such provides first indications of quality and handling of a locking system. This is why EMKA as the expert for locks, hinges and gasketing has extended its range of high-quality bow-type handles. 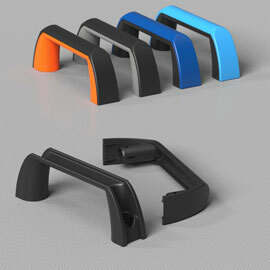 The new bow-type handle with cover can be installed easily, is shaped ergonomically, is available in various colours and can even be adapted to the CI of the company using it. The new development by EMKA consists of two parts: the actual handle and a cap. The latter can be clipped on by the fitter without using tools. The choice of colour is individual - depending on the taste and requirement of the customer who can also order the handle with the logo or slogan of his company, if required. The version with cover also captivates with a smooth and thus easy to clean surface. As an option, this surface is also available as an antibacterial version, for example for the use in sensitive environments such as in medical or food applications. Due to its modern design with a waisted handle piece, the new bow-type handle appears of higher value and is ergonomically optimised. The cap cover makes the screws and mounting parts invisible - a distinct design plus. The material is completely made of glass fibre reinforced plastic.